49ers (add WR Braylon Edwards, SS Donte Whitner and QB Josh McCown; keep FS Dashon Goldson) – We discussed the Edwards and Whitner signings in this post. Goldson is a talented free safety who looked for a big deal on the market but couldn’t find it. He re-signed for one year. McCown comes on board as a backup quarterback, at least until Colin Kaepernick is ready. Raiders (add TE Kevin Boss, safeties Matt Giordano and Josh Bullocks, and CB Lito Sheppard) – After losing Zach Miller to the Seahawks, the Raiders gave Boss a four-year, $16 million deal with $8 million in guarantees. Boss isn’t the dynamic receiver that Miller is, but he’s pretty good and will fill a need. He at least allows the Raiders to continue doing the things they want in their offense. After losing S Hiram Eugene, the Raiders added Bullocks and Giordano. Bullocks has great speed but hasn’t played consistently; Giordano is more of a system player. Likely only one will make the team. (UPDATE: Bullocks was quickly cut.) Sheppard was once a solid starter, but he has fallen off to the point that he is just barely a passable backup. Jets (add WR Derrick Mason) – Mason, who was cut by the Ravens, got a one-year deal to come to the Jets as the third receiver behind Santonio Holmes and Plaxico Burress. Mason is still a productive guy, and it wouldn’t be a surprise to see him find a bigger and bigger role as the season progresses. He’s a nice addition given his experience and dependability. Saints (add C Olin Kreutz, CB Trumaine McBride, RB Patrick Cobbs and PK John Kasay) – After losing starting center Jonathan Goodwin to the 49ers, the Saints brought in veteran Kreutz as a short-time replacement while they develop young players. The long-time Bear, who’s known as a locker-room leader, got a one-year deal worth $2 million. McBride is a vet who will fight to add depth at corner. Cobbs is a versatile back who does great work on special teams and is also a good receiver. Still, he’ll be fighting to win a roster spot. With PK Garrett Hartley hurting, the Saints brought in veteran Kasay from Carolina. Kasay still has pretty good field-goal pop for a 40-something. Patriots (add DEs Shaun Ellis, Andre Carter and Mark Anderson, DT Gerard Warren, LB Niko Koutouvides, S James Ihedigbo, and LS James Dearth) – We covered the Patriots’ defensive line pieces in this post. Koutovides will fight for a roster spot to provide depth at linebacker, and Ihedigbo will do the same at safety. Dearth takes over at long snapper. Chargers (keep WR Malcom Floyd and LBs Stephen Cooper and Kevin Bentley) – Floyd got a good look in Baltimore, but he ultimately decided to return to San Diego on a two-year deal. He’s a great complement to Vincent Jackson because he’s also big and fast. Cooper is a solid run-down inside linebacker who had a chance to start until he landed on injured reserve. Bentley came on board after that to add depth. Steelers (keep OLB Lamarr Woodley, add WR Jerricho Cotchery and S Macho Harris) – Woodley, the Steelers’ franchise player, benefited from the Steelers’ cap situation and got a six-year, $61.5 million deal. Woodley doesn’t get the pub that James Harrison does, but he’s a terrific pass rusher who steps up even more in the playoffs. Cotchery, an ex-Jet, adds depth and experience for a young receiving corps. Harris, an ex-Eagle, has yet to make a big impact in the NFL. Ravens (add RB Ricky Williams and OT Bryant McKinnie) – After losing Willis McGahee and LeRon McClain, the Ravens added Williams with a two-year, $4 million deal to back up Ray Rice. Williams and Vonta Leach fit better with Rice, because they will have more set roles that they can fill effectively. The result is a net gain for the Ravens’ running game. McKinnie fell out of favor in Minnesota, where his lax work habits and max gut impacted his play on the field. But the Ravens needed help at tackle, and McKinnie was the best option on the market. If McKinnie is right, he could start at left tackle and let Michael Oher move to right tackle, where he has played more effectively. McKinnie could also be a factor at right tackle as the Ravens try to develop rookie Jah Reid. The signing is a bit of a risk, but it’ll be interesting to see if the Ravens can get something out of McKinnie that the Vikes couldn’t in recent years. Eagles (add WR Steve Smith) – The Eagles continued their offseason spending spree by adding Smith, an ex-Giant, on a one-year, $2 million deal. Smith isn’ t healthy at the moment, but if he recovers he becomes a fine inside option for the Eagles’ talented receiving corps. Plus, he was Eli Manning’s safety blanket, so signing him hurts the Giants. That’s a win/win for Philly. Redskins (keep ILB Rocky McIntosh; add OT Sean Locklear, P Sav Rocca, and LB Keyaron Fox) – McIntosh is a solid starter at inside linebacker and a nice pairing with London Fletcher. Fox is more of a special-teams guy, but he provides depth as well. Locklear is a backup at tackle who has talent, although he hasn’t always shown it. Rocca takes over as the team’s punter. Falcons (keep RB Jason Snelling, add TE Reggie Kelly, S James Sanders, and CB Kelvin Hayden) – Snelling returns on a one-year deal as Michael Turner’s backup. Snelling is a bruising runner who also has some receiving skills. He didn’t find a starting job elsewhere, but he’s good enough to do so if Turner gets hurt. Kelly, a former Falcon, returns to serve as a block-first tight end behind Tony Gonzalez. Sanders, who started for the Patriots last year, is a solid but unspectacular player who provides some depth and assurance. Hayden, an ex-Colt, has played well when healthy but hasn’t been healthy lately. It will be interesting to see if Hayden or Sanders finds playing time. Lions (add RBs Jerome Harrison and Mike Bell and S Michael Johnson) – After losing rookie Mikel Leshoure to injury, the Lions brought in Harrison and Bell – who were traded for each other last season. They will likely fight for one spot to become the hardnosed complement to Jahvid Best. (UPDATE: It will be Harrison; Bell was cut.) Johnson, a former starter with the Giants, adds depth at a major trouble spot for the Lions. Don’t be surprised if he emerges as a starter. Vikings (add DE Stylez White) – After losing Ray Edwards in free agency, the Vikings waited until after the second preseason game and then added White, an ex-Buccaneer who’s at least an average pass rusher. It’s a nice find this late in free agency, because White has enough punch to keep defenses from completely skewing their protections to guard against Jared Allen. Bengals (add TE Bo Scaife) – Scaife, the long-time Titan, got a little more than the minimum to be the veteran backup for Jermaine Gresham in Cincinnati. Seahawks (keep DE Raheem Brock, add S Atari Bigby and LB David Vobora) – Brock was one of the underrated players on the free-agent market, so it’s a coup for the Seahawks to keep him. He’s not huge, but he provides a good pass-rush threat. Bigby was once a starting strong safety in Green Bay, but injuries limited him to four games last season, and he was replaced. He will help to fill the gap left by the departed Jordan Babineaux. Vobora, an ex-Ram, is effective but limited athleticially. Still, with Lofa Tatupu gone, he adds depth and should be good enough to serve as a backup. Giants (keep DT Rocky Bernard, S Deon Grant, and DE Dave Tollefson; add PK Rhys Lloyd, DT Jimmy Kennedy, DE Jimmy Wilkerson and CB Brian Williams) – The Giants cut Bernard in a salary cap move, but brought him back after the market didn’t offer a big deal. Bernard has talent, but 2010 was disappointing. They also re-signed Tollefson, a decent backup end. Grant played a lot in New York’s three-safety alignment last year, and is still good enough to contribute in pass defense. Lloyd is a touchback machine who is unproven on placements. Still, he should take pressure off of Lawrence Tynes. Kennedy, a former first-round pick, had a down year last year after rebounding in 2009 in Minnesota. He adds depth after Marvin Austin’s injury. Wilkerson adds depth at end. After injuries to Terrell Thomas and two other corners, the Giants brought in Williams for depth purposes. Williams really struggled with Atlanta last year and should be viewed as a break-glass-in-case-of-emergency option only. Titans (add S Jordan Babineaux, CB Frank Walker, OT Adam Terry, and WR Kevin Curtis) – Walker will help to replace injured CB Ryan Mouton. Babineaux, an ex-Seahawk, provides depth behind Chris Hope. Terry hopes to hook on as a backup swing tackle. Curtis continues his comeback from cancer in Tennessee, which has young receivers but not a ton of experience at the position. Cardinals (add DE Nick Eason, P Dave Zastudill, QB Brodie Croyle and CB Fred Bennett) – Eason is a solid backup 3-4 defensive end, and as an ex-Steeler he’s someone Ken Whisenhunt knows. He will add depth for the Cards. Zastudill will challenge Ben Graham for the punting job. Croyle, an ex-Chief, comes in as the veteran quarterback and sets the Cardinals’ hierarchy. Croyle will back up Kevin Kolb, with John Skelton as the developmental third quarterback. With Greg Toler hurt, the Cards picked up Bennett, whom the Bengals had cut. Bennett showed potential once upon a time, but it’s been years since then. Chiefs (add OT Jared Gaither, TE Anthony Becht, and S Sabby Piscitelli) – We discussed Gaither’s addition in this post. Piscitelli is a hard hitter, but he struggles in coverage. Becht is a veteran who is still an effective blocker. Still, he could contribute as a special-teams guy in K.C. Rams (keep WR Mark Clayton, OL Adam Goldberg and LB Ben Leber) – Clayton, who got off to a great start last year before injury struck, isn’t completely healthy but is now in the fold. He will get time to recoup from a Rams team that wants him to be a starter for them. Goldberg is a versatile lineman who can play anywhere across the line. He provides a security blanket for the Rams. Leber adds depth at linebacker. He’s still good enough to jump in as a starter if necessary. Panthers (add WR Legedu Naanee and DT Kentwan Balmer) – We discussed Naanee in this Panthers training-camp update. The Panthers claimed Balmer, who had been cut by the Seahawks, to address a gaping defensive tackle need that’s growing by the day. He’s worth a look-see, but the former first-round pick has yet to pan out and won’t be a huge factor. Bills (add WRs Buster Davis and Ruvell Martin and ILB Kirk Morrison) – Davis, a former first-round pick, was a disappointment in San Diego. Now he goes to Buffalo, where he will have to beat out a group of talented young receivers. Martin came on to add depth during a time of major injuries at the position. Morrison replaces the injured Reggie Torbor and should be an upgrade. He’s a solid player against the run, and he teams with Nick Barnett to give the Bills a solid duo at inside backer. Dolphins (add RB Larry Johnson, OT Ray Willis, LB Marvin Mitchell and S Gerald Alexander) – Johnson, a former elite back, tries to resuscitate his career in Miami. Even if he makes the team, he’ll have trouble finding playing time. Willis, an ex-Seahawk, provides depth at offensive tackle. That’s important if the Dolphins plan to rely on Marc Colombo as a starter. Mitchell is a backup linebacker who can play any spot and also a key special teams player. Alexander, a four-year vet, will try to add depth at safety. Colts (add DE Tyler Brayton) – Brayton doesn’t generate a lot of pass rush, but he was decent against the run the last couple of years in Carolina. He will add size to the Colts’ DE corps. Cowboys (add PKs Shayne Graham and Dave Rayner) – Graham signs on to compete with David Buehler for the Cowboys’ kicking job. When Rayner was released in Detroit, the Cowboys quickly brought him into the mix too. Browns (add OT Oniel Cousins) – The Browns claimed Cousins, cut by the division rival Ravens, to add depth at right tackle. He’s worth a look, especially for a team with OL needs. Texans (add WR Bryant Johnson) – Johnson, a former first-round pick, hasn’t panned out at any stops, but he has enough athletic ability to be an acceptable No. 4 receiver. If he has to play much, though, the Texans are in trouble. As part of our draft review, we want to compare the significance of the veteran players who were traded during the three-day draft. We’ll compare these veterans on the move using relativity, with 10 denoting the most significant mover and 1 denoting the most minor move. For a comparison of the players traded between the end of the season and the draft, check out this post. And watch this week for a full comparison of each team’s draft classes. 10 – QB Jason Campbell from Redskins to Raiders – Campbell’s days were numbered as soon as the Redskins acquired Donovan McNabb. Now he moves to Oakland, where he could shove former first overall pick JaMarcus Russell out of town. Campbell isn’t a terrific quarterback, but he’s at least an average starter in the NFL, and if he ever gets to learn a single offense, he could still develop. Those hopes of stability are more like pipe dreams for Campbell in Oakland, but the fresh start should help. It’s certainly worth a 2012 fourth-rounder for the Raiders to see if Campbell can develop. 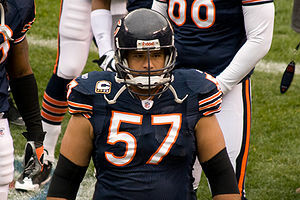 7 – LB Kirk Morrison from Raiders to Jaguars – After drafting Rolando McClain in the first round, the Raiders had no need for Morrison, who had done a good job as their starting middle linebacker the past few years. The fact that the Raiders appear to be transitioning toward a 3-4 defense also made Morrison’s role obsolete in Oakland. But he’ll be an asset well worth a fifth-round pick for the Jaguars, who had the most pedestrian of linebacking corps. Morrison will help Jax immediately. 7 (con’t) – RB Leon Washington from Jets to Seahawks – Washington missed most of the 2009 season with a major knee injury, and so the explosiveness he displayed early in his career is now a question. But if Washington gets healthy, he’ll be a huge asset to the Seahawks and bring an explosiveness that simply wasn’t there last year. Washington can break the big play as a runner or receiver, and if Seattle wants him to have a role on special teams he can help there too. The Jets decided that draftee Joe McKnight was a healthier and cheaper alternative to Washington, and so they dealt Washington for a fifth-rounder, but only time will tell whether that move to youth was the wise course for them. 5 – CB Bryant McFadden from Cardinals to Steelers – McFadden moved from Pittsburgh to Arizona last offseason after the two teams met in the Super Bowl, but McFadden’s physical, zone-friendly style didn’t really fit the attacking defense the Cards favor. So Arizona dealt him back to Pittsburgh for a fifth-round pick. McFadden isn’t great, but he’s an acceptable No. 2 corner, and so he’ll be at least a stopgap at a huge need position for the Steelers. Arizona, meanwhile, turns a low-dollar free-agent signing into one year of a starter and a fifth-round pick, which isn’t a bad return on investment. 4 – RB LenDale White and DT Kevin Vickerson from Titans to Seahawks – In a trade that basically amounted to a giveaway, the Titans sent White and Vickerson to Seattle to move up just seven spots in the fourth round and just nine spots in the sixth. White is a burly back, but even though he got in better shape in ’09 than ’08, he didn’t produce. That decline, plus the emergence of Chris Johnson, made the sometimes unhappy White expendable for Tennessee. In Seattle, White will once again play for Pete Carroll, his college coach at USC. Carroll knows how White can be an asset, but Seattle fans must hope he doesn’t get too attached to White and overlook his limitations. Still, White and Leon Washington, plus holdover Justin Forsett, should constitute an improved RB situation for Seattle. Vickerson, meanwhile, is a defensive tackle who moved into Tennessee’s rotation but didn’t distinguish himself. It appears the Titans were looking to replace Vickerson, so getting a little draft equity out of a player who would have been cut makes sense. The fact that Seattle wanted Vickerson shows how little DL depth the Hawks have. 1 – LB Tim Dobbins from Chargers to Dolphins – In the deal that allowed the Chargers to trade up and draft RB Ryan Mathews in the first round, San Diego sent Dobbins to Miami. The four-year veteran linebacker has just 10 career starts, but he has at least 55 tackles in each of the past two years. He’ll fit into the inside linebacker mix for the Dolphins’ 3-4. This is our next to last post choosing the best players at each position by jersey number. If you have quibbles, leave a comment and we’ll update this post. And please have patience – this is a big job. We started this project with wide receivers in this post and then with tight ends in this post and quarterbacks in this post and running backs in this post and offensive linemen in this post and kickers/punters in this post and defensive linemen in this post. Now we move to linebackers, who can wear numbers in the 50s and the 90s with a few exceptions. If a number is omitted, it’s because no linebacker who has played this season wears those digits. 46 – Vinny Ciurciu, Lions – Ciurciu is the only linebacker currently wearing 46. He has played in six games this year, seeing most of his action on special teams. Now with his fourth team, Ciurciu also has a good locker-room nickname (see the bottom of the linked post). 47 – Brit Miller, 49ers – Miller is the only linebacker currently wearing 47. The rookie out of Illinois has played in two games this season. 49 – Zack Follett, Lions – Follett is the only linebacker currently wearing 49. The rookie out of Cal has played in nine games this year, mostly on special teams. 74 – Aaron Kampman, Packers – Kampman, who moved from defensive end to outside ‘backer this season as Green Bay implemented a 3-4 defense, kept his old D-lineman number. Kampman didn’t have a great transition season, with just 3.5 sacks in nine games before suffering a season-ending injury. But he’s still a good player, and he’s the only linebacker wearing 74, so he merits a mention. 90 – No linebackers wearing 90 have played a game this season. 91 – Tamba Hali, Chiefs – Hali is emerging as a solid pass rusher in Kansas City, with 7.5 sacks thus far this season. He gets the nod at this number over Cameron Wake, Miami’s CFL import who has 5.5 sacks in his first NFL season. 93 – Anthony Spencer, Cowboys – Spencer has been a disappointment at outside ‘backer since the Cowboys made him a first-round pick three years ago, but as a full-time player he gets the nod over Jason Trusnik, who has moved into the starting lineup in Cleveland after a midseason trade from the Jets.